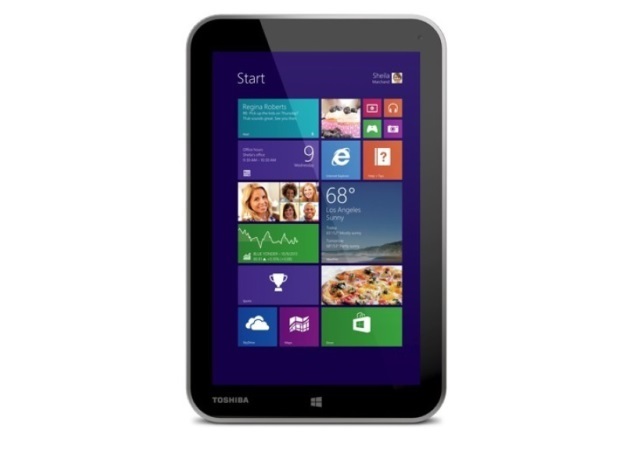 Toshiba has unveiled a new 8-inch tablet running Windows 8.1. Called the Encore, the tablet is one of the first devices to run the latest version of Windows, which won’t be released until midOctober. The tablet is sleeker than those in Toshiba’s Excite range, but still sports a fairly thick bezel and rounded corners. The version I saw had a silver plastic rear casing, but I’m told the final product will feature a dimpled texture. On the back of the tablet is an 8-megapixel camera and it is joined by a 2-megapixel camera on the front. At the top of the Encore are two microphones with beamforming technology that drowns out background noise, making it ideal for video calling. As the Encore runs full-fat Windows 8, it comes with Microsoft Office Home and Student 2013 pre-installed, making it ideal for those looking for a tablet they can also do serious work on. Toshiba thinks people will primarily want to use the tablet in portrait mode, and while this is usually the case with 8-inch tablets, Microsoft Office programs — one of the biggest draws of the tablet — tend to be easier to use on a landscape screen. Xbox SmartGlass can also be found on the tablet, allowing gamers to use the tablet as a second screen to adjust settings and the like during gameplay. The Encore costs £249 and comes with six months free access to Xbox Music and a month of free international Skype calls thrown in. Toshiba also showed off a 13-inch tablet-laptop hybrid called the Satellite W30t (know as the Click in the US). In the detachable tablet is a 5-hour battery and in the keyboard dock is another 5-hour battery, giving the laptop a total of 10 hours of battery life, according to Toshiba. A full range of ports and slots are available in the base, with Micro-USB, Micro-HDMI and microSD slots also included within the tablet. It starts at £599 for the AMD and £699 for the Intel version, both with 4GB of RAM and a 500GB hard drive. The other new device from Toshiba is the NB10, a Windows 8 notebook with an 11.5-inch touchenabled screen. It’s a sturdy-looking, smart little laptop costing only £329, making it ideal for hose wanting the full Windows 8 touch experience on a budget. Mumbai: The Galaxy S3 Mini is yet to officially make an entrance in India despite being launched last year, and there’s already a Galaxy S4 Mini in the works. SamMobile has got hold of some live photos of the younger brother of the Galaxy S4 and this time too, Samsung has stuck to the formula it started with the S3 Mini. For one, the S4 Mini looks a spitting image of the Galaxy S4, but that’s where the similarities stop. The S4 Mini’s rumoured specs reveal a mid-range handset, which is only a slight improvement over the 2011 flagship Galaxy S2 in terms of specs. Even last year, the S3 Mini’s specs reminded us of the Samsung Galaxy S to a large extent when it came to the specs, with the exception of the design and mild upgrades in the hardware, of course. The photos below confirm that the S4 Mini will even feature the back cover design of the latest Samsung flagship. And the “Mini” label is a bit of a stretch as the S4 Mini is quite large at 4.3 inches. Despite a large screen, the resolution of the device is a measly 960×540. With the qHD resolution, the S4 mini has exactly half the number of pixels on that display as its big brother. The Galaxy S4 Mini (GT-I9190) will be available in a dual-SIM version as well, rumoured to be called the Galaxy S4 Mini duos (model number GT-I9192). The Galaxy S4 mini will be powered by a 1.6GHz dual-core CPU, which we suspect is a dual-core Exynos 4 chipset. It’s slightly bigger than the Galaxy S3 Mini, but that is to be expected considering the larger display. Like the Galaxy S4, the Mini will run Android 4.2.2 Jelly Bean. According to the website’s source, the Galaxy S4 Mini will likely make its debut in June or July this year. 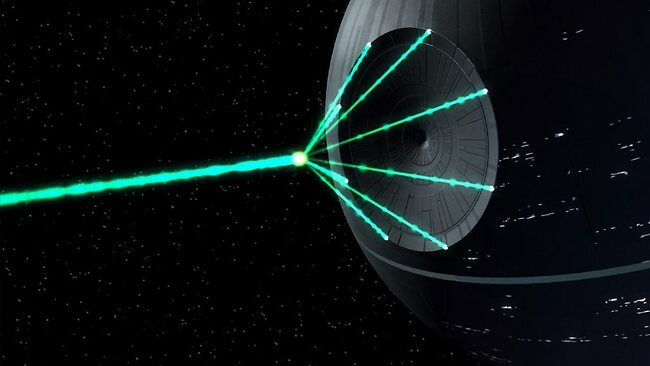 BARELY a month after the White House rejected a petition to build a Death Star, a group of Californian scientists have pushed the idea forward again. Instead of blasting rebellious planets, their proposed DE-STAR project is intended to be a “realistic” project to vaporise asteroids that pose a threat to Earth. They’ve chosen the timing of their pitch well after last week’s meteor explosion over Russia and a close shave with a potential killer asteroid. University of California physicist Philip M. Lubin and California Polytechnic State University researcher Gary B. Hughes unveiled a series of proposals for their Directed Energy Solar Targeting of Asteroids and exploRation (DE-STAR for short). While not quite at the scale or strength of its Star Wars namesake, some of the proposals get close. And they’re designed to be more realistic than the Kickstarter campaign to build a Death Star replica. 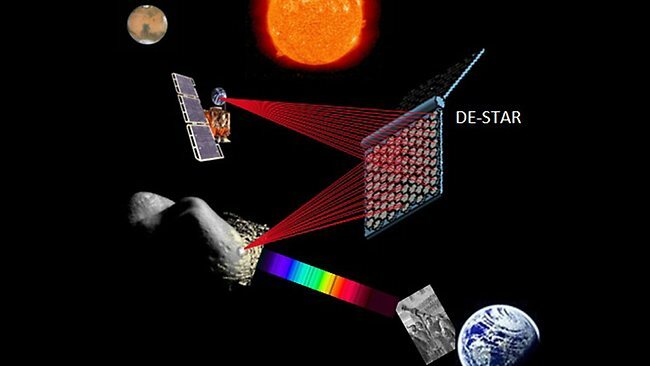 All versions of the DE-STAR satellites would gather energy from the Sun and direct an array of lasers at approaching objects. The cheapest option incorporates a series of desktop-computer satellites. At the other end of the scale is a massive orbital city capable of propelling spacecraft over interstellar distances. 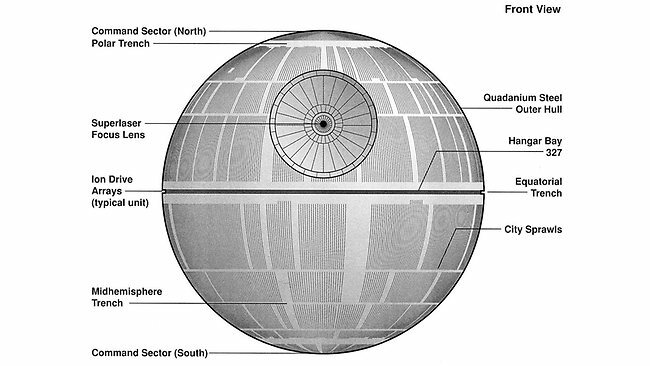 Original idea: The plans for the Imperial Death Star that featured in Star Wars. One of the proposals is an International Space Station sized satellite named DE-STAR 2. This would be capable of nudging large asteroids into safe orbits. DE-STAR 4 weighs in at 100 times the size of the existing space station, this system could vaporise a rock within a year. DE-STAR 6 is the most ambitious: “DE-STAR 6 could enable interstellar travel by functioning as a massive, orbiting power source and propulsion system for spacecraft. It could propel a 10-ton spacecraft at near the speed of light, allowing interstellar exploration to become a reality without waiting for science fiction technology such as “warp drive” to come along,” Professor Lubin said.